I love a good curry. “Curry” comes from the Tamil word kari, and is a generic reference to anything that accompanies rice or breads. It does not refer to any dish or combination of ingredients in particular, but it has been a part of the British palate since the 1700s. The first curry recipe in Britain appeared in The Art of Cookery made Plain and Easy by Hannah Glasse in 1747. There are a huge variety of curries to explore, from the mild korma to the hot vindaloo and far more besides. And this, Mr Stein may well be the best vindaloo recipe I’ve ever used. The recipe comes from Rick’s fabulous Rick Stein’s India, which is a beautiful book, with plenty of gorgeous photographs and clear recipes, I particularly like the notes in the back of the book which include extras (such as recipes for garam masala, chat masala, naan etc) and information about ingredients, techniques and suppliers. Rick writes so passionately about the food and the culture behind it; he has the ability to bring to life the stories which surround each dish and explains the cultural significance and tastes in such an evocative way, making me feel I am almost joining him on his culinary journey. I’m not going to claim it is a quick fix, it is by no means. You have to start the day before you want to eat this delectable treat. A spice paste is to be made and the meat left to marinate in its blanket of goodness overnight, or at least a good few hours, the longer the better really. I choose to use whole spices and grind them myself – sure, getting the pestle and mortar out and bashing all the ingredients up to make a fragrant concoction is all part of the fun. Right? Vindaloo is associated with the Indian state of Goa, it has its origins in Portugal – the word ‘vindaloo’ doesn’t come from Hindi, as might be assumed, but from ‘vin d’alhos’, meaning wine and garlic in Portuguese. On its arrival in Goa, the wine was substituted for vinegar, and over time gained the name of ‘vindaloo’. 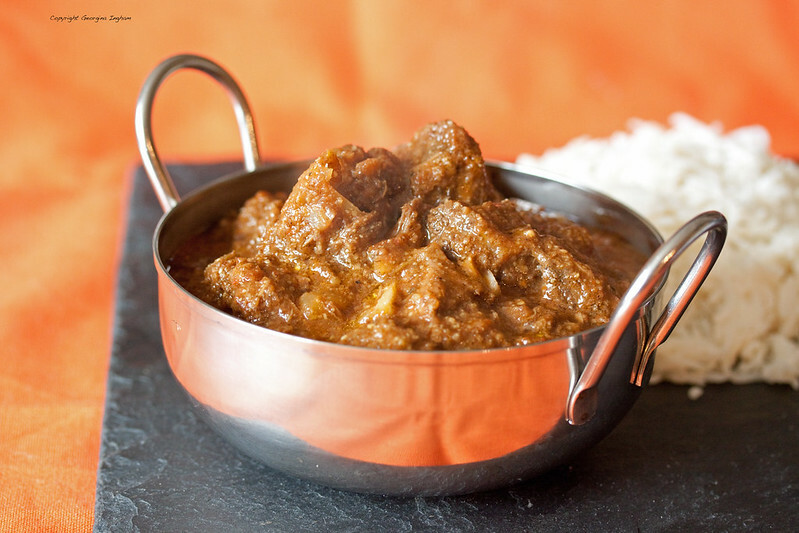 Vindaloo is traditionally made with pork, but beef & lamb also work well, and has a vinegar-onion-garlic base, thanks to the Portuguese influence that still prevails in Southern India. Generally speaking, the further south you go in India, the spicier the food will get; and this version is one hot curry. Reduce the amount of chilli used if you so wish, but, please note that the curry will loose some of its authenticity – it is meant to be hot, but not burning hot. If you’ve had bad experiences of a vindaloo in a dodgy takeaway or Indian restaurant, don’t let it put you off for life, give a homemade version ago and you may well be very pleasantly surprised. Cook the curry very slowly. Cheap cuts suited to slow simmering really do work best for this dish as it gives the spices and vinegar time to infuse and develop in flavour. I urge you to give your takeaway curry a miss and try this. A few bottles of Indian beer mandatory. 1. Grind the cinnamon, black peppercorns, cloves, cumin seeds and cardamom to a powder. 2. Put the onion, garlic, ginger, tamarind, salt, sugar, chili powder, turmeric, vinegar and all the ground spices into a food processor and blend together to a paste. 3. Mix the beef and the paste together in a large bowl, coating the beef well. 4. Cover the bowl and transfer to the fridge for a few hours, preferably overnight. 1.Heat the ghee in a large, sturdy pan or casserole over a medium heat. 2. Add the onion and fry for 10 mins, until softened and golden. 3. Increase the heat to medium- high, add the beef and all its marinade paste and fry for 5 mins stirring occasionally. 4. Stir in the tomatoes, green chilies and water, cover with a lid and cook for 3 hours until the meat is tender and checking every so often to ensure it has not become too dry. 5. If so add a splash of water and stir.Serve the beef vindaloo. 1. Melt the ghee in a heavy-based pan that has a lid, add the nigella seeds and cook for a minute or so until fragrant. 2. Stir in the rice, letting it get slicked with ghee and thoroughly mixed with the nigella seeds. 3. Pour the coconut milk, water and salt into the rice and stir gently. 4. Bring to a boil, then turn the heat down to low and put on the lid. 5. Cook for 15 minutes, by which time the rice should be cooked and the liquid absorbed. 6. Fluff up with a fork and serve.